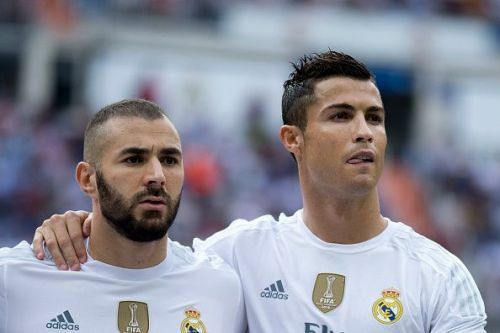 Real Madrid forward Karim Benzema says he is happy with his new role at the Bernabeu since Cristiano Ronaldo's departure, adding that he is glad to finally be the leader of the attack rather than a mere provider. Ronaldo left Los Blancos after nine years with the club during which he netted an incredible 450 goals in 438 games. The 34-year-old joined Serie A giants Juventus last summer and has already become a strong influencer at the club. Benzema, on the other hand, left Lyon to move to Real Madrid in 2009 but has often been criticized for his comparatively average efficiency in front of goal. Since Ronaldo's departure, however, the Frenchman has been put on the spotlight and has scored 20 goals in 40 appearances for Los Blancos so far. Benzema has now expressed his happiness with his new role at Real Madrid, adding that he is glad he could play what he calls his "true football". Speaking in an interview with France Football, he said, "Before, there was a guy who scored more than 50 goals a season and I was in the role of provider. "I played geared to Cristiano. We formed a good duo. I looked for him continually with the objective to help him score even more goals. "Now, I am the leader of the attack. It is up to me to make the difference. I am very happy because I can play my true football." The striker also addressed the difficulties he has faced at a big club like Real, stating that he always knew there were going to be obstacles. "There have been many sacrifices. Everyone knows that in a career there are some highs and lows and, when I arrived at Real in 2009, I was initially surprised. Because Lyon, in comparison with Madrid, is small, the institution, administration, everything which goes around the club. "I knew there would be barriers to overcome because it is the best club in the world. And I have succeeded." After their controversial win over Levante last weekend, Real Madrid are preparing for their Clasico clash against Barcelona in the Copa del Rey on Wednesday night.